Acquiring a new pet and bringing him or her into your home is a huge responsibility. For many new pet parents, vaccinations and general healthcare requirements are confusing. Here's a breakdown of the most important information, neatly packaged for your convenience. Both dogs and cats are protected against disease by antibodies found in their mother’s milk, provided she has a healthy immune system. Once their own immune systems develop, antibodies are no longer needed and the vaccinations kick in. Your veterinarian will also recommend a number of non-core vaccinations pets need to have and advise you how often these should be received. Pet parents know the best way to avoid dogs and cats from reproducing is to have them spayed or neutered. The procedures have medical benefits in addition to population control, too. Unless your pet comes from a highly-pedigreed bloodline intended for future breeding purposes, it’s best to have them “fixed” as early as possible. Some additional advantages of spaying female dogs and cats include prevention of uterine and breast cancers, and avoiding the pet coming into heat twice a year with all the attendant issues such as aggressive behavior, marking territory and leaving blood spots. With male pets, neutering helps to prevent testicular cancer and prostate problems, according to the ASPCA. Intact (not neutered) male cats and dogs both have a tendency to roam in search of females, so if you want to keep your pet happily homebound, then neutering is the best way to do it. Neutered males are also less likely to spray or fight other males, and once they have the procedure they tend to settle down and become healthy, loving and contented pets. General pet health and well-being requires a few other necessary procedures, including regular deworming, flea & tick control, dental care, healthy nutrition and exercise. Overweight pets have the same increased risk for heart disease and diabetes as overweight pet parents do, so consult with your veterinarian about the right quality and quantity of food to give, and how to ensure your pet gets suitable, frequent exercise. Teach your fur-babies from a young age to accept having their teeth cleaned frequently (ideally every day, just like you), which will save you endless money and the stress of having dental work done later. A clean, healthy mouth also ensures your pet has tolerable breath and prevents some of the illnesses that develop as a result of gum disease. 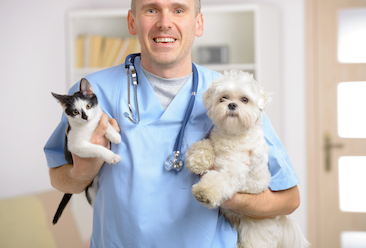 Your veterinarian is of course the best person to evaluate the health of your new pet. Make sure you schedule an appointment to see your veterinarian within the first few weeks of your new pet coming home. You will receive valuable guidance so that your pet will enjoy a long, healthy and happy life with you.